This is an exceptionally appealing neighborhood library. Andrew Carnegie amassed his fortune in the Nineteenth century, primarily in the iron and steel industry, but he also invested in oil. At the time, he was one of the richest individuals in the world. He was also a generous philanthropist. In 1885, he began his long-standing practice of building public libraries with a major grant to Pittsburgh for their structure. By the time of his death in 1919, he supported the construction of about 3,000 public libraries in the United States, Canada, the United Kingdom, and upward of a dozen other countries. Fifty-three different Michigan cities received funds from Andrew Carnegie to build libraries. On June 3, 1901, the Andrew Carnegie Foundation made a grant of $750,000 to the city of Detroit to fund libraries. The city’s public library system was founded on March 26, 1865 but was, in 1901, still a modest operation. Indeed, Carnegie made his grant in 1901, but the Detroit Public Library did not accept it until 1910. If you accept the Consumer Price Index as a measure of inflation, the Carnegie Foundation’s $750,000 to Detroit’s libraries would be evaluated at about $24 million in 2009. Library authorities in Detroit reserved one-half of their Carnegie grant for constructing the Main Library on Woodward, the beautiful white marble structure designed by Gilbert Cass. The other one-half of the Carnegie grant was, I believe, devoted to building branch libraries. I think that at least four of those Carnegie Detroit libraries are open today: the Bowen Branch Library on West Vernor; the Conely Branch that you see pictured above, the Duffield Branch Library on West Grand Boulevard and the Gabriel Richard Branch on Grand River. 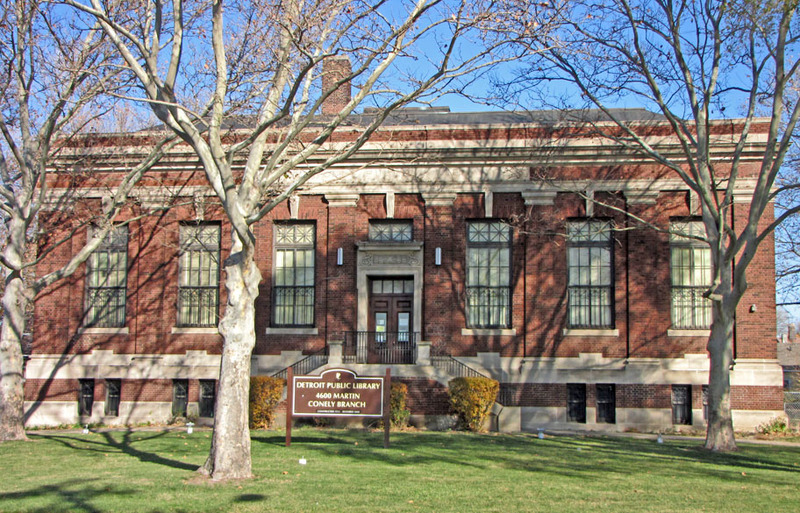 The Mark Twain Branch on the east side may also have been a Carnegie library, but has been unused for several decades. Four other Detroit Carnegie libraries are not, I believe, any longer in existence: the George V. N. Lothrop Branch that was at West Warren and Grand; the Henry M. Utley Branch on Woodward, the Magnus Butzel Branch at East Grand and Hutzel and the George Osius Branch on Gratiot at Newland. 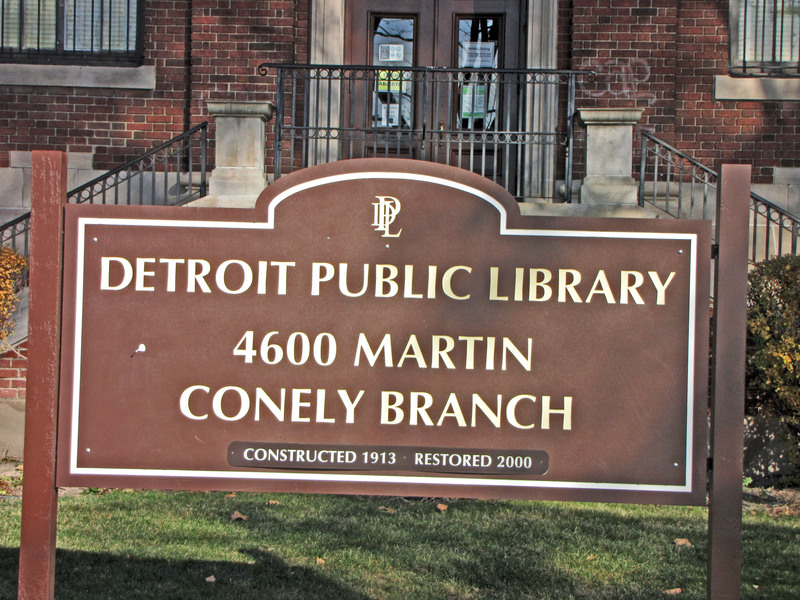 The building you see was named to honor Edwin Conely, a Detroit attorney who served on the city’s Library Commission. It was built at a cost of $40,000 in 1912. The architect, Hugh Clement, may be better known for his design of the North Woodward Avenue Congregational Church on Woodward. The voters of the city of Detroit, in 1992, approved a major bond issue to refurbish the city’s schools and libraries. Some of those funds were used to restore this branch library to its original glory. This is one of the most attractively landscaped inner cities libraries that I have visited. Library systems adapt as technology changes. They also change as one immigrant group arrives to replace earlier immigrants who move to the suburbs. The Edwin Conely Branch now provides services in Polish—the language of the immigrants who lived here when it was built—as well as Spanish and Vietnamese. A History of the Detroit Public Library; Arthur M. Woodford; Detroit: Wayne State University Press: 1965.